As an authority figure, strong leadership skills are your key to success and understanding various leadership styles and their outcomes give us the power to choose how we will lead. In my leadership development program, we study the science behind 10 different leadership theories and one question inevitably gets asked each time. What Leadership Style Is Most Effective? Over decades of studying, practicing and implementing the theory of various types of leadership, I’ve found golden nuggets in each. However, above all I’ve found this one truth to be most valuable: Authentic leadership is always most effective. I once had an employee in a satellite office who regularly had to drive through windy mountain passes. When the company decided to replace all vehicles with new 2-wheel drive only, she no longer felt safe making that trip during the winter months. I went to bat for her trying to get an exception, but the answer still came back no. I decided to do some extra work and was able to find a company vehicle that had 4-wheel drive just sitting idle! It was perfect so I made the 5 hour drive out to bring it to her. When I showed up, the first look in her eye was envy! When I told her the car was for her, she got tears in her eyes. She couldn’t believe I went to extra efforts to get her a 4-wheel drive, and then drove 5 hrs to get it to her. That moment felt pretty great, but the real magic happened after. This employee transformed! She went from being a typical employee to highly committed and engaged, and incredibly loyal to me. We still enjoy keeping in touch today, 13 years later. This along with other early wins in my career helped me understand that leading others using concepts from transformational leadership theory, situational leadership theory, and servant leadership theory is my authentic style. I get a zing of joy in my heart and mind when someone I’ve lead or coached has obtained that job promotion they seek or have been recognized for excellence in some way that I assisted. How can you develop your authentic leadership style? 1. Complete a 360° degree personality assessment. A 360° assessment requests anonymous feedback from those in your work and personal life. The questions asked are designed to shine a light on your strengths, limitations and blind spots. All the best organizations use these in their leadership development programs, government and private alike, as they are extremely effective. Typically only available through pricey paid services, I’ve recently created one I’d like to offer you for free! To get access to your FREE 360° assessment, email me and I’ll send you the information! You’ll be shown your strengths and limitations on 15 different leadership competencies such as motivating, coaching, delegation and more. This paid assessment will give you extensive research on each of your top attributes and can launch you into defining a more focused and comprehensive leadership style for yourself. For those ready to place their personal development as a priority. Coaching refines your limitations, challenges you in ways you didn’t know you needed and opens up opportunities previously unavailable to you. If you’d like to book a free 15-minute call with me to discuss your career goals, please reach out! No pressure, I’d love to hear from you. P.S. If you like this article, the best compliment I could receive would be subscribing or forwarding this onto a friend! A landmark case study of the Cleveland Clinic (CC) illustrates it perfectly. 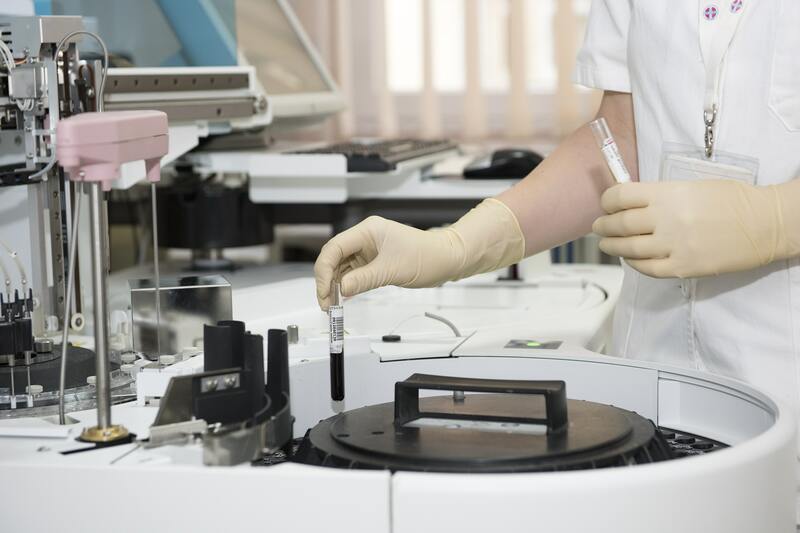 This institution, well known for their cutting-edge medical research and technology, in 2007 was plagued by low patient satisfaction and poor employee engagement in their 44,000 person staff. One could argue this kind of feedback is like the black mark of death to any large organization! Well, they knew they had to take major action and, after much research and consideration, launched a huge leadership development program to overturn these looming statistics. Can you guess what it was? They didn’t throw resources at enforcing the consequences of bad behaviors or incentivize leaders to act differently. Here’s what worked. To remedy the situation they trained leaders from the top down on concepts of servant leadership. 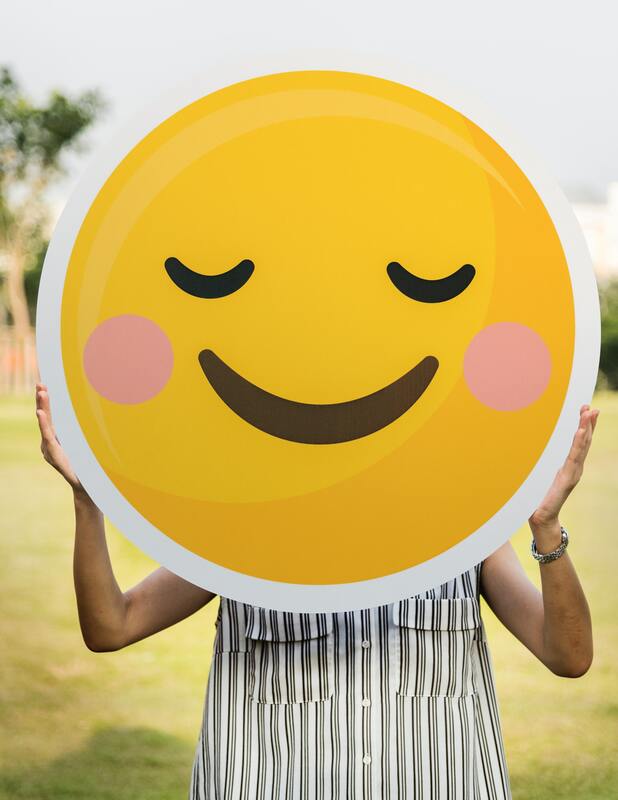 It took a few years to train all the leaders but soon enough employee engagement began to climb and subsequently, so did patient satisfaction, as measured by an objective third-party. Servant leadership is simple yet profound. It means sincerely putting the interests of our employees and the organization ahead of our own. It means putting aside self-interest and really caring about the success of other people, and acting accordingly. At first, many CC employees were skeptical if it would make a difference, including many of the leaders. As the practices of servant leadership became part of the culture, the positive shift in employee engagement and patient satisfaction followed. Get down in the trenches and do some of the gritty work for a bit among those you lead. Talk with them and get face to face with the obstacles that they have to overcome every day. For a servant leader, no job is beneath their pay grade. Do something fun or out of the ordinary with your team that will build bonding and trust. Go laser tagging or plan an after-hours go-kart race. Bring in a specialist (like me) who can provide a rich team-building activity. Spend time connecting with them and talk to them about non-work related topics. Show genuine interest in them as a person. You’d be surprised how much this will mean to your team and their desire to not only follow you but help you succeed because they actually like you as a human, not just their boss. Have they been asking for something recently? New office supplies, or a simple software upgrade? Have people complained the chairs hurt their backs or the copy printer needs replacing? Take action! Send out surveys asking one thing, “What can I do better to help you enjoy working here?” Take action on their suggestions! Show them you are listening and you care about their concerns. Their problems are your problems. Like what you read? Thank you! There’s no greater compliment than subscribing or forwarding this on to a friend! Here’s a telltale sign of your ability to influence, and one of my favorite questions to ask my coaching clients. Ask yourself this question: Which of your people would follow you if you had no authority? Well, I got my way but I had lost the trust, respect, and support of the most important person on my team. As you can imagine, things didn’t go well after that. Our relationship was strained and our productivity fell. If I had been savvier back then, I might have understood that maintaining a good working relationship was more important than asserting my authority or proving I’m right. A question I like to ask leaders is, “which of your people would follow you if you had no authority?” Some people follow us because of our position of authority, and some follow us because of our personal character and competencies. For the follower, it’s either because they must comply with the requirements of the boss, or because they are committed to the leader’s vision. Which mindset would you rather have people follow you? Which do you think would produce a better outcome? The answer, of course, is obvious. If you’re truly looking to improve your leadership skills, take action. This week, look at the leaders around you. Which category do they fall into and why? How can you more fully engage and share your vision with your team and those under your stewardship? There are typically 3 types of hazardous conversations: Ones that go badly, ones that go well, and ones that go avoided! Think of a conversation you’ve had that you wished had gone better, and now imagine it went exactly the way you hoped. In this article, we will reveal the secrets and techniques of people who masterfully prepare for and navigate hazardous, high stakes conversations. One of the most hazardous conversations we encounter in the workplace is giving negative feedback to employees, coworkers, contractors, and customers. In 2009 a Gallup Inc. study of over 1,000 employees based in the US revealed some impressive information about the impact of feedback. The survey asked each worker to rate their manager on whether they focused on the employee’s strengths and positive characteristics, or focused on weaknesses and negative characteristics. Respondents that did not choose either were classified as being “ignored by their manager.” Results showed that employees receiving positive feedback were up to 30x more engaged than the employees receiving no feedback. This may not come as a surprise to anyone, but more interestingly employees that received negative feedback were up to 20x more engaged than the employees that received no feedback at all! Meaning, giving little to no feedback is much worse than giving negative feedback, according to the study. So knowing the importance of feedback, how do you tell someone they have a booger on their nose, or their skirt is too short? Or harder still, how do you tell someone their work is not up to par, or that their negative attitude is diminishing productivity in the office? Here are 3 steps to follow when the time arrives for a difficult conversation. Step 1: Set the stage. Prepare a Fact-Based Script. No matter how hard we try on the outside, people usually respond to how we’re feeling towards them on the inside. Do you already dislike this person and are going into the conversation with some pre-loaded ammunition based on past annoyances? Ask yourself “what is my end goal for this conversation? Do I value and respect the humanity of this person, and do I want a good relationship with them?” Use these answers to prepare a script of some fact-based phrases you can use to direct the conversation. Ask for permission to start the conversation. Let them know you have a sensitive topic to speak about by saying something like “Can I talk to you for a minute?” This slightly more formal invitation lets the person know that this conversation is pre-planned, and avoids the feeling of uncomfortable AND unexpected. Set the expectation right from the start. Make it private. Privacy shows respect for the person’s feelings and reputation. You can talk in your office, away from the group or if there is really no private place, invite them to a coffee shop during a lunch break. It’s worth the effort to show the person that you care about their feelings. State the problem. Be candid without judgment. Tell them the facts by saying something like “I’ve noticed…” or “It has come to my attention… ” Show them that you care about them and their career. Many people struggle to give feedback because they hate to feel mean. They want to avoid making others feel bad but what if it was you? Would you rather work your tail off in a project doomed to be unsuccessful, or have office coworkers gossip about you unknowingly? Most people agree that they would rather be respectfully told what the issue was. Giving constructive or necessary feedback shows that you care about them, what they are working on and about their career or reputation. State the consequences. Make the issue less about how you are personally impacted, and more about how they and the organization could or will be impacted. Ask the other person’s opinion. Once you’ve said what you came to say, ask them for their thoughts. Expect them to be defensive. It’s absolutely human nature to become defensive when being told to make a change. Give them time to process without making it worse by reacting further to their reaction. Agree on a change. First ask them what change they think needs to be made, then give your input. Be clear on what result you want from this conversation. Once you agree on a change, get out of there! 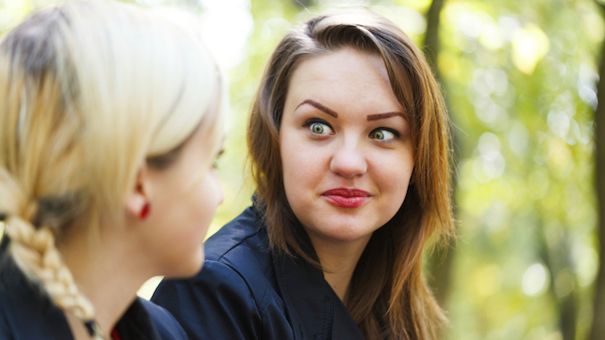 Negative feedback should last no more than 2 minutes; people don’t want to sit there feeling awkward and defensive. Let them escape. Follow Up. Often the problem may not resolve in just one conversation and you may need to bring it up again. This is the accountability portion of the feedback and what sets apart true leaders. Build the relationship. Make a special effort to ensure the two of you are in good standing. Talk with the person often and show genuine friendship and care. Build a more trusting, worthwhile relationship. Being a great leader and having these hard conversations take courage and effort. Each time you are stretched to navigate an experience like this you become a more refined team member and a greater, more trusted leader. You have it in you to handle these conversations with grace! For more preparation and an in-depth look into this topic, be sure to check out our latest webinar on this very topic, Hazardous Conversations. If you’re looking to increase your influence, win over clients and build more meaningful relationships in your business, then keep reading. Extremely successful leaders throughout all types of businesses have this one thing in common. They’re socially in-tune with those around them, or in other words, socially aware. Business studies conducted around the globe have demonstrated the strong impact that social awareness of its leaders have on the overall success of an organization. Leaders who exhibit strong emotional competencies consistently outperform their counterparts. So what does “strong emotional competencies” mean? “You will catch more flies with honey than vinegar” is a classic idiom we have all heard, but also a golden principle for successful leaders. Being socially aware refers to being aware of what others are feeling through what they are saying and how they are acting. It also means being aware of what’s happening around you, understanding the effect your words and actions have on others, being tuned into organizational politics, and being aware of how our environments influence us. Successful leaders know that in order to reach their goals they cannot operate alone and it pays to be nice. This is such a commonly understood and accepted truth, yet it’s shocking to see how many are unable to act on it. Skeptical about how social awareness could actually prevent you from reaching that next step? Let’s take James for example. 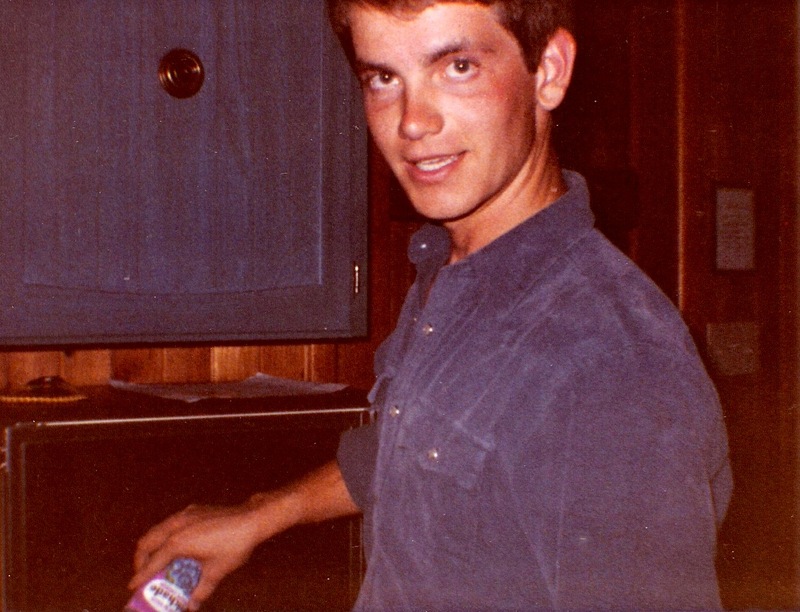 James was a department manager in a large corporation. He was highly qualified, intelligent and driven to succeed. Sounds like the perfect cocktail right? Yet he ended up loosing complete support of his team, missing his goals and being passed over for promotions? Let’s break it down. 1. He was blind to the needs of his team. 2. He did not take the time to learn their individual interests and strengths. 3. He was oblivious of the team’s dissatisfaction with his leadership. To James, his team dissolving and the upset with his leadership was a surprise and shock, but for the team members, it was a slow build up. This is being socially unaware. Now, take my good friend and colleague, Sara. Sara is authentic and has high integrity. I know it, her company knows it and her team knows it. She has an ability to bring out the best in others and utilize their strengths, reaching her goals without stepping on any toes. So what makes her leadership abilities shine so brightly? 1. She has a knack for finding common ground and bringing opposing parties together for mutual gain. 2. She is gracious in her successes, and shares the wealth with her team. 3. She genuinely connects with people on a personal level. Just like kids on a playground, we all want to be on the team with the nice captain rather than the bully. Make a special effort to smile, stand up straight, make eye contact and avoid crossing your arms. Ask an employee how they are, and listen with the intent to understand. Do they have children or an interesting hobby? Even just ask about their weekend plans. Level with them and be a friend. 1. What are some of my strengths? 2. What are some of my weaknesses? 3. Rate my body language: 1 being aggressive or intimidating, 4 being open and friendly. 4. Rate my tone of voice: 1 being aggressive or intimidating, 4 being open and friendly. 5. Rate my ability to handle stress: 1 being extremely unpleasant to be around, 4 being handles stress professionally and with grace. 6. Rate my listening skills: 1 being doesn’t listen well and 4 being “I always feel heard. These three tips will boost your social awareness, which will enhance your effectiveness as a leader. “The Complete Summary: Working With Emotional Intelligence By Daniel Goleman.” Soundview Executive Book Summaries, 2010. “The Business Case for Emotional Intelligence.” Cary Cherniss, Ph.D, Rutgers Universoty; Consortium for Research on Emotional Intelligence in Organizations, 1999. “Return on Emotion: Predicting and Improving Human Performance.” Diana Durek and Wendy Gordon, February 2006. A vector has two components: direction and magnitude. A direction is the straight line from here to there. Magnitude is how much talent, skill and energy is driving us from here to there. Vector theory begins with facing reality and ends with achieving a vision. 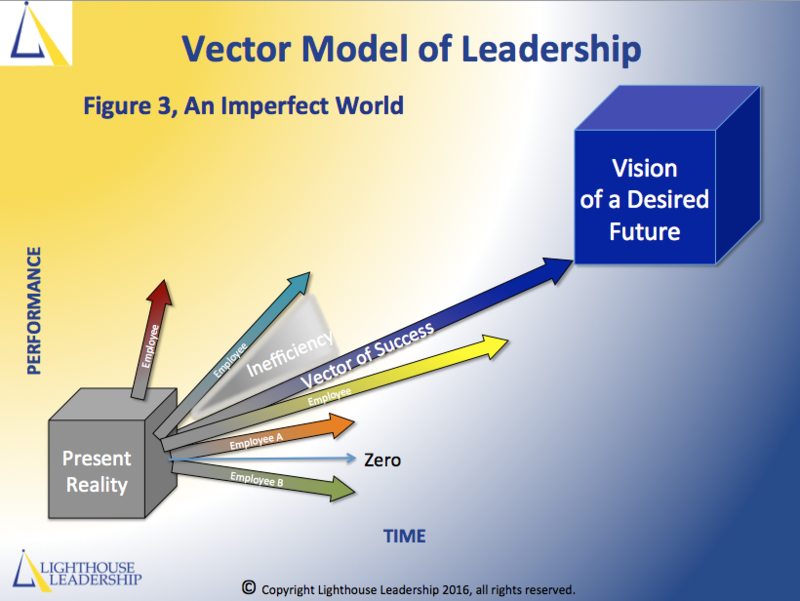 High-performance leaders know we can’t make progress if we don’t have an accurate idea of our present performance reality, nor can we make progress if we don’t have a clear vision of the desired future that we’re trying to make progress toward. Before we can know where we want to go, the first step is to discover the reality of where we are in the present. Finances and market stats are often the primary measuring sticks, but assessment of our talent pool and organizational culture are also critical, although difficult to measure. Investigate by holding meetings, host organizational surveys, employee assessments, and gather the facts. Put all that information into a box, this gives us a clear (as possible) view of our present performance reality. Next, we formulate a concept of how we want to be at some future time. This is the beginning of our Vision of a desirable future that is better than our present reality (Figure 1.) Having a worthwhile vision, specific, and clearly articulated, is a hallmark of a great leader. The great leader says, “I have a dream . . .” or, “Let me describe to you what I think we are capable of accomplishing together.” The vision is often created in a collaborative effort; an aggregation and evolution of ideas. But the vision means nothing without buy-in from the many. Planning a feasible pathway from the Present Reality to the Vision of the Desired Future is critical. We analyze conditions, project outcomes, and strain our minds to figure out what critical success factors are required to get us there. We set goals based on critical success factors. We measure our progress by setting up measuring sticks, Key Performance Indicators (KPIs). The feasible pathway is our Vector of Success. Getting from here to there is done through other people. In a perfect world all people in the organization would understand the Vision perfectly and work toward the Vision perfectly (Figure 2.) The sum of the efforts of each individual employee would add up perfectly to achieve the Vision. The result is we have a bit of chaos in the individual vectors of the employees (Figure 3.) Each vector that does not align with the Vector of Success reveals an inefficiency. Sometimes we have employees who, like Employee A and Employee B in Figure 3, work in equal and opposite directions of the vertical axis, and their net result is zero. What a waste! Misaligned individual vectors cannot be avoided. The big secret to the Vector of Success is a course correction. The Apollo 11 moon flight was reportedly off course 90% of the time (Charles Garfield, 1997), yet landed within 15 feet of its intended destination. This was accomplished by two key continuous elements: a feedback system, and course corrections. We need to become informed when we’re off course, and we need to be willing and able to make corrections to get us back on the intended course. These concepts seem self-evident to us because we all experience them. Consider learning to play a sport or a musical instrument. We practice over and over again and get better and better. If we’re lucky we have an expert coach or instructor to give us feedback and help us make timely course corrections. Consider employees we know who are unsuccessful. Isn’t it often that they just don’t see that they’re off course? Maybe they’re not getting the feedback they need from us. What if we the leaders don’t see that we’re off course? Beyond the bumbling that goes on when the blind lead the blind, what does it say about our feedback system? If we have one at all, is it giving us feedback that is accurate, timely, and relevant? A feedback system provides an update on our Present Reality. When feedback has identified the need for a course correction, how do we do it? When correcting employees there are specific skills necessary to make it effective and constructive, that we won’t go into here. When correcting employees there are specific skills necessary to make it effective and constructive, but those will be described in a future article called Feedback and Course Corrections. Imagine with me, what your life will be like when your employees understand, are committed to, and have the skills to achieve a shared vision of a better future for the organization. Would that mean greater success for you? A feeling of satisfaction and fulfillment? Less stress for you? Is that a vision worth fighting for? There are people who make it happen, others who watch it happen, and the rest who wonder what happened. How would you describe your present reality? What evidence do you have to know your understanding is accurate? 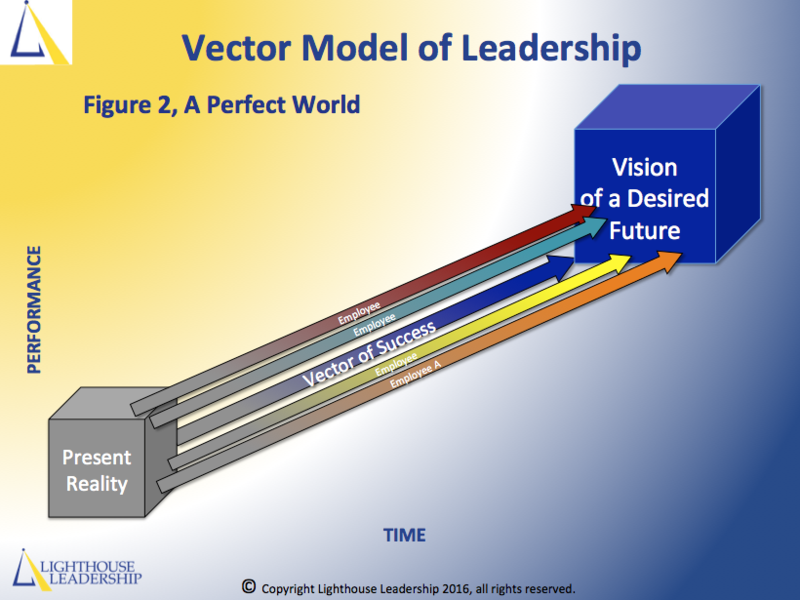 How would you describe your clear and detailed vision of a desired better future? How well do your employees understand the vision and their part in getting there? What feedback mechanisms do you have to identify when someone is off course? What corrective mechanisms do you have in place for one who is off course? You may wonder what it looks like to have a leadership coach. The Lighthouse Coaching Model that describes it is found HERE. Vector leadership is all about strategy. Rather than shooting for a goal and hoping you land perfectly, recognize where you’re at in the present, set the course for where you want to go, and create well crafted KPI’s along the route to ensure you’re on course. Expect course corrections! For coaching, group training or workshops contact me here. 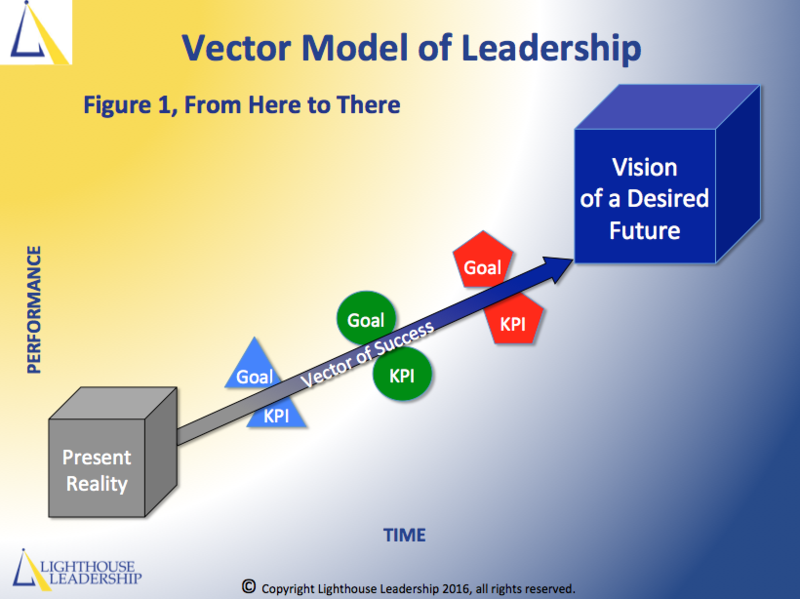 Let’s make Vector Leadership happen for you, together! Can you name this carnivorous mammal? Sometimes we feel certain about our knowledge of things . . . until something new squashes our certainty. This creature is the first new carnivorous mammal to be discovered in over 35 years – after we thought we had found and named them all. Native to Ecuador, the olinguito is a tree-dweller that likes to eat fruit and meat, weighs about two pounds, and is extremely adorable. This rare discovery demonstrates, once again, that we humans don’t always know as much as we think we do. What do you feel certain about? As leaders of people, feeling too sure of ourselves can be dangerous. Like when we feel certain that the reason employees keep leaving our organization is that they are disloyal or unreliable or fickle. The reality may be that they leave because they have a bad boss. Maybe that’s you, or maybe it’s me. Or it’s like when we think we always explain things clearly, yet employees keep getting it wrong. We feel certain the employees are a little thick-skulled or slow-minded, when it may actually turn out that we’re not as good at explaining things as we thought we were. Or how about those micro-managers. When we hear people talking about them, that’s not you or me, right? We would never get into a stressful situation and find ourselves telling people exactly how to do each task, and watch them carefully to make sure they do it according to our specifications, right? Until we overhear an employee describing us that way. The remedy? To paraphrase the father of modern continuous quality improvement, Edwards Deming: a system (or leader) can not see itself. The transformation requires an outside view. A coach or consultant can help us see ourselves more clearly. If you’re not getting the results you think you should, and you’re willing to question the things you feel certain about, congratulations! This is the first step toward discovery and enlightenment. Call me, I can help with the rest. Business studies conducted around the globe have demonstrated the impact of social awareness of leaders and employees on the overall success of an organization. Leaders who exhibit strong emotional competencies consistently outperform their counterparts. “You will catch more flies with honey than vinegar.” A classic idiom we have all heard, but also a principle successful leaders are mindful of. In short, they know that it pays to be nice and that to be successful, they cannot operate alone. This is such a commonly understood and accepted “truth”, I am always surprised at how many fail to act on it. I once worked with a department manager, James, who was highly qualified, intelligent, talented and driven to succeed. He was always so focused on results, however, he was completely unaware of the impact he had on his staff or other departments. He also tended to operate in a vacuum with little regard for others or their interests. James was so blind to the dissatisfaction left in his wake; he ultimately lost the support of his team. Simply put, he was socially unaware and it eventually cost him as he fell short of goals and was passed over for promotions. Fortunately, the world is also full of people who are socially aware and I have had the pleasure of working with a number of them. My good friend and colleague Sara is one example. I admire the authenticity and integrity she has always demonstrated in professional relationships. She knows how to bring out the best in others and how to use all the human talent at hand to reach goals without stepping on anyone. Like other successful leaders, Sara has developed a knack for finding common ground and bringing together opposing parties for mutual gain. She is gracious in her success, shares the wealth with her team and has been able to achieve so much more because she genuinely connects with people on a personal level. It just goes to show, you can build teams, even armies, of people to work for you and help you reach your goals; but whether you are the head of a large corporation, a department manager or the owner of a small business, simply surrounding yourself with talent and resources is not enough. Just like kids on a playground, we would all much rather be on the team with the nice captain, than the bully. Social awareness is the cornerstone of emotional intelligence. It comes first from being self-aware and being able to manage yourself and your own emotions and then develops from an understanding of the people around you. When you become socially aware, you are better able to empathize with others’ emotions, as well as the intent behind their actions. You are also better able to understand your environment and recognize the factors that influence people and impact outcomes. At the heart of social awareness is empathy. True empathy combines understanding both the emotional and the logical rationale that goes into every decision. Leaders who can develop this level of awareness, and empathize with others, are better able to adapt, persuade and motivate their team to achieve greater results.1 James was unable to accomplish this, whereas Sara excelled. Understandably, social awareness skills are highly regarded as critical attributes of today’s successful business leaders. It is taken for granted that top managers like James have the expertise, business knowledge and technical skills to do their jobs. In a highly competitive market, the real advantage is found in leaders, like Sara who exhibit a high emotional IQ with a well developed social awareness. Empathy: Understanding others emotions, needs and concerns. Organizational Awareness: Understanding the politics within an organization and how these affect the people working in them. Service: Understanding and meeting the needs of others. Business studies conducted around the globe have demonstrated the impact of social awareness of leaders and employees on the overall success of an organization.2 Leaders who exhibit strong emotional competencies consistently outperform their counterparts and have a strong track record of success, increased revenues, significant cost savings and higher employee and customer satisfaction. Corporations have come to recognize the economic impact of emotional IQ and seek out these traits in potential leaders. The unique thing about emotional and socials skills is that, unlike traditional IQ, emotional IQ can be improved.3 Emotional competencies and social awareness can be routinely assessed and, with guidance, practice and training, can be developed and fine-tuned. Lighthouse Leadership has worked with hundreds of companies and professionals, identifying and removing the barriers to success through standardized, scientific assessments and progressive leadership coaching and training in emotional intelligence and social awareness. We can help your team overcome their limitations to reach a higher potential. For more information please contact Doug Lundrigan, doug@lighthouse4business.com. Rarity confers value. Take natural pearls, for example. Only about one in 10,000 natural oysters will have a pearl in it, and far fewer than that will have a pearl with desirable form and color. I recently stumbled across a high value pearl in business, a rare gem in the health care industry. Come gaze with me in wonder, at something exceptional. A talk I was giving at the Oregon Health Care Association was called, “Authentic & Mindful: A Powerful Combination.” After I concluded a man approached me, his body language exuding excitement. “You’ve validated what I’ve been doing at my facility!” He is the chief administrator of a skilled nursing care facility. Allen James, tall, good-looking, and fortyish, described to me an amazing transformation in culture that has occurred at his facility. Frankly, I was skeptical. I know that successfully changing an organization’s culture is rare, takes many years, fraught with challenges, and requires much persistence. Kind of like forming a natural pearl. So we met at his facility, Gateway Care & Retirement Center (Gateway) in NE Portland. This time his passion in describing his people and culture was even more inspiring. His excitement was infectious to me. What came through was his love for his employees and facility residents as he described experience after experience of the wonderful interactions between people. I wanted to meet some of these people. 1. Unity of vision. Each staff member could state and describe the facility’s vision. There were no outliers, no misunderstandings, no tangential visions. And they believe it. They have “bought in,” they are engaged in it. When asked, some of them said they were doubtful when first introduced to the new vision. Then they watched it come to fruition first in Allen’s actions, then in other leaders. That stimulated the buy-in. 2. Celebrate the Love. Every interviewee used the words “family” or “love” or both to describe their culture. They all had real examples of things coworkers or bosses did for each other that demonstrated their love. They talk about and celebrate those experiences with each other. They share one another’s joys and burdens, they cry together, and the feeling grows. What was most startling was that loving people at work was a choice for each person. Not like “falling in love” as if love is an external force acting upon us. The good staff at Gateway make a daily decision to act in loving ways. Their love for each other is generated from within themselves as a conscious behavioral choice. “Love is good business,” as Allen puts it. 3. Relentless. At every All-Staff Meeting, every party, every gathering, even in the break room the vision is discussed, and examples shared of it being practiced. This has been consistent for over a year. It takes extreme focus and commitment to keep that up. 4. Personification of Principles. Starting with Allen James, spreading on through department heads to the whole staff, the principles of their vision are acted upon and lived out. The vision is not a set of lofty platitudes to be posted on the wall and forgotten. It’s more like a way of life to be embodied by all. They make the vision real by their actions. 5. People CAN Change. And they did change, they are changing. Each interview included at least one example of a person who changed positively in some significant way. The first one to change was Allen James. What compelled the change? From our discussions Allen would identify believing and living the LEAP* principles as the compelling force. People see themselves differently first, feel loved and supported, which gives them energy and space in which to change themselves, and then change their world. 6. Perpetual Lovely Road. “We’re not there yet” was a frequent comment. Although there has been a rare and wonderful cultural shift, it’s not over. The common sentiment seems to be that, we have not arrived, we are enjoying the journey, we continue to do what’s working. The love we feel gives us energy to keep going, striving to change the world, talking about the proving experiences that what we’re doing is real and effective. 7. Metrics of Success. It’s not theoretical. Since the time their culture shift began to be implemented Gateway’s Medicare rating improved from a four star to a five star, Quality Measures improved from a one star to four star, turnover decreased by 15% from the previous year, and revenue improved by 10%. Wouldn’t we all like those kinds of results in our business? Nursing homes are not glamorous. Talking with residents who may have trouble with coherent thought, the scent of sanitized bodily excretions, the mundane daily tasks of keeping the elderly in reasonable health. This is not the stuff of dreams or an inherently engaging workplace. And yet out of these circumstances Gateway has created something precious. The staff won’t leave, even for higher paying jobs, and the residents consider it the home they love. The staff at Gateway are creating a pearl of great value. * The Gateway vision is called LEAP, from the book called The Radical Leap, by Steve Farber. LEAP is an acronym for Love, Energy, Audacity, and Proof. A full explanation can be found in the book. Each of us have patterns that emerge as we engage in conflict. These are our conflict management styles (CMS). Each of the five styles are suited best for specific situations. You, like me, probably don’t always use the optimal CMS for a given situation, which results in disruptive conflict. Matching the right CMS to the situation stimulates constructive conflict. Masters at conflict management are able to consistently make the right match. I call that skill, Situational Conflict Management. Which style do you usually use? Collaboration is sometimes called cooperative problem solving. When collaborating, one has a high concern for self and a high concern for others. A collaborative conflict management style enables people to work together so everyone wins. It involves redefining the problem at hand, in order to find a solution that will meet each individual’s interests. Competition involves a high concern for self and a low concern for others. Choosing a competitive conflict management style means a person is putting his or her own interests before anyone else’s. This produces a “Win-Lose” situation and is a disruptive style of conflict management. Individuals can sometimes be so committed to getting what they want, they end up ruining friendships and work relationships in the process. A compromise involves a medium concern for self and a medium concern for others. Individuals choose this style of conflict management when it is important to satisfy some of their interests, but not all of them. They are likely to “split the difference,” or agree, “Something is better than nothing.” With a compromise, everyone wins something but everyone loses something as well. Individuals who choose avoidance do not get involved in conflict. They have a low concern for self and a low concern for others. This is the most frequently used style for dealing with conflict, which says, “You decide and leave me out of it.” It’s often used as a conflict management style until the problem can’t be ignored any longer. Accommodation is when one has a low concern for self and a high concern for others. People who choose accommodation as a conflict management style put their interests last and let others have what they want. These individuals believe that a good relationship is the most important aspect, and that a good relationship requires accommodation. Each conflict management style has its own strengths and weaknesses. Which type of conflict management style do you use most? For a simple personal assessment, or to learn more about Situational Conflict Management, please contact Lighthouse Leadership. What’s it going to take for you and me to be more successful this year? I loved my first business, but I was struggling. I was doing something very close to selling ice cube s to Eskimos. I was selling ice cream to Canadians. So what’s not to love about ice cream? It doesn’t sell well when there are three feet of snow on the ground. I had to do something to survive the short selling season of summer. The winter months gave me plenty of time to get good at analyzing, planning, and optimizing my business practices. The business executive checklist (Exec Check 7) was planted like a seed in that cold place almost 30 years ago, nurtured by the warm sunlight of my coaches, by the pure water of education, and the rich soil of experience, it matured to a fruit-bearing tree in my current company, Lighthouse Leadership. I have a passion for sharing that precious fruit with my peers to help you assess how ‘on target’ you are to make the next year better than the current year. Are you ready for a better year? ☐ 1. BHAG. What is the Big Hairy Audacious Goal* for my organization next year and beyond, and can I articulate it in a clear and inspiring way? ☐ 2. Personal Competencies. What is my plan to hone my personal skills and talents so that I am a better leader next year? Who can I trust to tell me the truth about what I don’t see about myself? Do I have the courage to ask? ☐ 3. Employee Engagement. Have I measured employee engagement for my organization, and am I satisfied with it? What specific actions will I take next year to gain the discretionary efforts (willing efforts by employees above minimum job requirements) of my people? Who is leaving my organization and why? ☐ 5. KPI Score. What are my organization’s Key Performance Indicators (those metrics that predict success) and what will be our weekly, monthly, and yearly stretch goals for them? These are the steps toward achieving your BHAG. ☐ 6. Razor’s Edge. What will I do next year to get or stay on the cutting edge of knowledge, systems, marketing, and technology in my industry? How did you do with the checklist? If you’ve got these under wraps you’re headed for a highly successful year. These are not exhaustive, but are the most crucial. You can fill in the missing pieces, if needed, by examining your culture, strategy, structure, core processes, and efficiency. Do you feel stuck on any of the Exec Check 7? Lighthouse is ready to help. You too, can be brilliant! * The term BHAG was coined by Jim Collins and Jerry Porras in their 1994 book Built to Last. Conflict is an inevitable result of social interaction in our everyday lives. It occurs because we engage in situations and circumstances with people who have different goals, values and backgrounds. In every work place conflict is present to varying degrees. We define conflict as a “strong disagreement between people, groups, etc., that often results in anger and arguments.” When management teams know how to resolve conflict effectively, they save time by turning potentially destructive situations into positive opportunities for growth and development. Conflict can be split into two categories, disruptive conflict and constructive conflict. 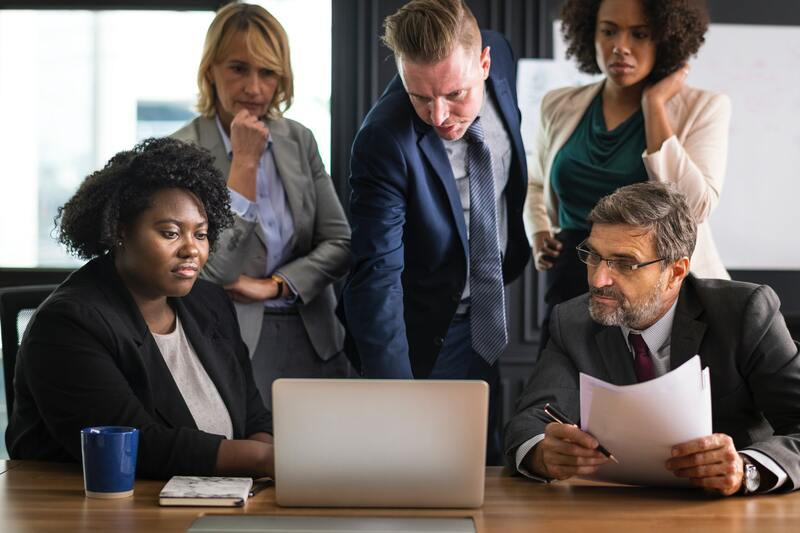 Disruptive conflict may result in unhealthy competition, defensive communication, personal attacks and a closed work environment, all of which hinder productivity. On the other hand, constructive conflict results in cooperation, collective focus, open work environments and supportive communication. It is not possible for two or more people to work together and always agree. Conflict can, at times, be necessary and beneficial, and help foster team growth. Constructive conflict can help make you more focused on the work at hand. Disruptive conflict can make you resistant and defensive. One way to reduce discomfort with conflict or disagreement is to identify and use common steps to manage conflict in a positive way. Effectively dealing with conflict is one of the most difficult aspects of being in a leadership position. When faced with conflict, we often react without realizing that we have constructive, healthy choices available to us, and we unconsciously start pushing back. Well-managed conflict can spark creativity and challenge employees to think about what they are doing and how they might improve methods and procedures. Come back next week to learn about: The Five Management Conflict Styles! Please “share,” or “comment” on this article. If you can ensure that the five primary dimensions of trust are present throughout your organization, you will be in a great position to navigate economic and market challenges in today’s business environment. The predictability and reliability of executive management in the eyes of the employees will, in large, determine the loyalty of the workforce in tough times. Unfortunately, many surveys and research studies report that senior management is the least trusted group in an organization. Research on this dimension consistently reports that employees have a greater level of trust in their immediate supervisor than any other management level in the firm. When a manager’s behavior toward employees is consistent over a period of time, employees can reasonably predict that manager’s behavior. The manager will be trusted at a high level. Managers who have difficulty demonstrating faith in others are typically not highly trusted. Whereas the first two dimensions span the company hierarchy, this dimension explores horizontal interaction, involving manager-to-manager and employee-to-employee interaction. Trust is a foundational piece of teamwork and the presence or absence of trust can predict the effectiveness of a team or group of peers. This dimension can be greatly impacted by collusion, secret interactions, plots, and agreements that undermine and erode authentic, constructive workplace interactions. The impact of this dimension has been apparent for some time. Lack of integrity, indifference to the end user and an “anything to increase profits” mentality have soured customers and investors for decades. Consumers have “advertising fatigue” and demand a more personal relationship with the companies with which they do business. Though this may be the least-reported-on dimension, the presence or lack of trust with suppliers, vendors and third-party partners has a significant impact on company growth and health. 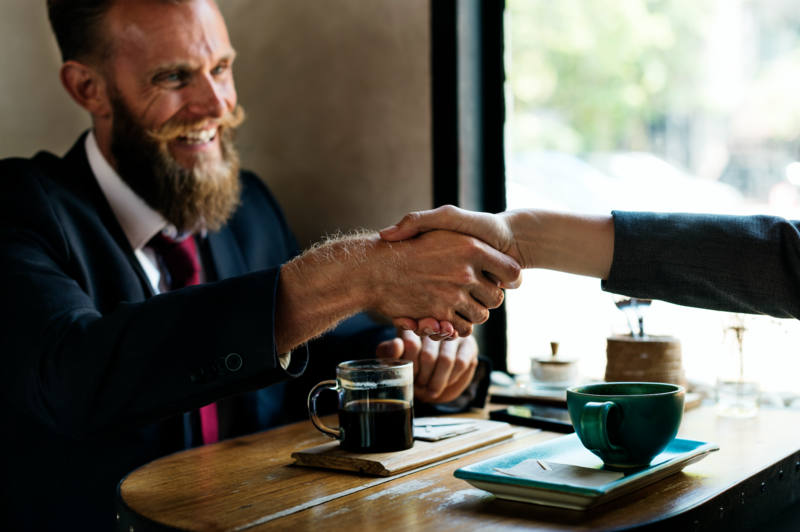 This element of trust is crucial given the increasing role that outsourcing and other third-part y relationships are taking in today’s business environment. For more information on corporate trust issues you can find a valuable white paper and additional articles on this website. Please feel free to comment or share this article! the relationship between parts and has a long-term plan and perspective. through excellent and impartial communication skills. Expert Leaders should be able to master all five of these roles. In traditional organizations, Leaders often emphasize the manager and technician roles. However, in High Performance organizations, leaders emphasize the architect, trailblazer and coach roles. The key to leadership is finding the right balance between these roles. If there is not a good balance, the organization will be lopsided. Leadership is the most important factor in achieving and sustaining organizational success. Leaders have the power to influence an organization. They provide the vision, inspiration and motivation that direct the organization as a whole. A higher value should be placed on initiating change, solving problems and implementing processes, therefor achieving long-term results and building commitment. Remember, leaders do face challenges every day. Leadership involves working with many complex individuals, each filled with common emotions. People cannot be programmed like computers. Instead, people act on their own free will and are often unpredictable. Poor leadership always results in poor production and high turnover. Leaders must view your organization “from the balcony,” or from the outside looking in. Leaders are the ones with a “big picture view” of what is happening on the floor or in the cubicle. Good leaders do not get caught up in the hustle and bustle of the organization; they take overall observation. Good leaders cannot be ‘micro-managers,’ but have trust in their subordinates and delegate. Would you like to provide your leadership staff with better leadership skills? Contact me today about the many seminars and trainings I have for corporations just like yours. www.lighthouse4business.com. I look forward to hearing from you! The concept of a team is not unfamiliar to us. From athletics, to school assignments, to volunteer activities, we are trained to become members, active participants and, even, leaders of teams. Most people recognize that teams are crucial to the success and progress of businesses and organizations. Yet, the difference between a “group of people working together” and a high performance team is similar to the difference in a LION hunting its prey on the African savanna and a domesticated CAT sitting in front of a fire. High performance teams are more than a group of people working together to accomplish a common task. They share a common vision and purpose that inspires their performance. They feel accountable for their work, solve problems, make decisions and fully invest themselves in the organization. In order for a team to achieve high performance, they must be allowed the time to set their purpose, operating norms, characteristics and desired performance results. High performance teams have been defined as self-managing, multi-functional groups of people who are organized around a whole process and empowered with full responsibility for their own success. To achieve this, certain elements must be present. The CHARTER (or the “why”) is the definition of why the team is in existence and provides clarity for team members. It focuses on the customers, purpose, team goals and team vision. The DESIGN (or the “what”) is the architecture of the systems and structure of the team. It focuses on the core work processes, roles and responsibilities, procedures and norms, and systems. The RELATIONSHIP (or the “how”) is the area in which team members understand how to relate to each other. In this element, the focus is on trust, respect, communications, cohesion, and synergy. Come back next week for Part 2 of this story – and do contact Lighthouse4Business.com to talk about our trainings for your teams. Why should your business be interested in an esoteric subject such as Emotional Intelligence? Why should your firm invest training dollars in a program designed to increase emotional competencies for your staff? Does it make a difference when employees are aware of their feelings, values and goals? For any business that would like to see increases in productivity and efficiency, more effective sales people, more creative teams and more nimble management—the answer is an unequivocal YES! In his best-selling book, Emotional Intelligence, Daniel Golman reported that research shows the traditional IQ test only accounts for 20% of a person’s success in life. (1) What accounts for the remaining 80%? Psychologists have concluded that a portion of the missing factors lie in Emotional Intelligence. The more aware we are of our own emotions, the more control we have over them; and the more we empathize with the emotions of others, the more emotionally intelligent we become. players. They maintain an optimistic outlook on life, which helps them overcome obstacles. Their ability to delay gratification and to manage stress, anger, envy and other negative emotions helps them build productive relationships and complete tasks. Emotional Intelligence is not some New Age, touchy-feely concept. In fact, the United States Air Force saved three million dollars by using Emotional Intelligence Screening to select recruiters. Those with the most Emotional Intelligence were three times as effective as general candidates. The more emotionally competent recruiters also stayed on the job longer, cutting training costs. Emotional Intelligence is crucial for most roles in business. But business people have one overriding question: How does it affect the bottom line? Can putting employees in touch with their emotions actually make them more productive? Find out more by contacting me today via my web site. I look forward to hearing from you! (1) Goleman, D. (1995). Emotional Intelligence. New York: Bantam Books. The predictability and reliability of executive management in the eyes of the employees will, in large, determine the loyalty of the workforce in tough times. Attend a High Performance Leadership seminar to increase the level of trust in your organization. Find out more at www.lighthouse4business.com. So what happens when a job requires transitioning from left-brain to right-brain job functions? For example, a physician who is an excellent technician and very analytical, gets promoted to department head which requires emotional competencies that are under-developed? What does the individual do? Bumble around, or take intentional steps to increase his or her competencies? The same goes for the right-brained graphic artist who may be promoted to an Art Director, now responsible for managing others within a structured environment and budget. Can this person tap into the analytical skills necessary to be successful in this new role? Is it possible to train the non-dominant side of the brain in order to improve our skills and emotional intelligence? The answer is YES! But how does one begin to engage skills from the non-dominant side of the brain? It simply starts by learning something new. The brain is like a muscle, the more it is “flexed,” the stronger it will become. For the left-brained Physician who just became the Department Chief, by flexing the right side of the brain, she can dramatically improve success factors such as innovation and teamwork within the department. The same holds true for the right-brained Sales Person who has just been promoted to Manager. By training the left brain, he can improve success factors using analytics and metrics. What is this mindfulness stuff that everyone seems to be talking about, and how can I get some? What do you think? It’s all about meditation and spiritualism? A set of skills that can be developed? Has some scientific research behind it? So it’s all about finding a heightened awareness by intentional presence without judgment. Well that sounds much like the emotional competency (E-Comp) workshops I give that include self and social awareness. As I describe the knowledge and skills of E-Comp I break it into four sub-categories as shown here. It seems to me there is a clear overlap between mindfulness and E-Comp. There is no war between mindfulness and E-Comp, but harmony. As we do make that connection we obtain a very significant advantage. Yes, there is excellent research behind mindfulness; the focus it brings to the mind, the calming effect it can have, and the improved neural pathways that can be developed over time. The research on E-Comp and related topics is, however, dozens of times more voluminous. There are thousands of controlled scientific studies over at least 30 years on various aspects of E-Comp, or EIQ. Many of those studies focus on measuring tools. Whereas we don’t really have a validated method of measuring mindfulness, we do have many validated tools to measure self and social awareness. So if you want to know how mindful you are, and how to get more of it, step into the world of E-Comp. I can help. For more information on E-Comp please check out other articles, my white paper, and take an online self-assessment. Confidence in your relationships with others – a strong faith that they will meet your expectations in three areas. Trust has long been a part of the foundation of society; yet, it is often used and abused in the business world. Even though trust is a key aspect to all relationships, it can be misunderstood or mismanaged in many companies, which leads to serious consequences over time. These characteristics of trust are present, in greater or lesser degrees, across five different dimensions. Regardless of the relationship, if trust is not present, miscommunication, unmet expectations and reduced effectiveness all negatively contribute to an organization’s mission. Sometimes getting started is the hardest part. So many of us are desperate to follow our dreams and live the lives we imagine, but when it comes down to actually starting our own small business, it’s easy to get bogged down in fear and lose momentum … or give up entirely. That’s why I wanted to introduce you to my [colleague/business mentor/teacher] Jackie B. Peterson. Jackie is an entrepreneur, business coach, and the author of Better, Smarter, Richer: 7 Business Principles for Encore, Creative, and Solo Entrepreneurs. She has worked with thousands of [solo/creative/encore] entrepreneurs, and she knows what it takes to get your business off on the right foot. I’ll be joining her on Friday, August 21st at 10 a.m. PST for a free webinar, and I hope you will too. It’s all about how to conquer that fear, take the leap, and start your [creative/encore/solo] business from scratch. In addition, we’ll be getting a sneak peek at her brand new webinar series Best Beginnings, which launches September 16th. Sign up for this free event here: http://app.webinarjam.net/register/2556/f36acb69c5 See you on the 21st! All leadership behaviors can be grouped into five major roles. planning and the status quo. the relationship between parts, and has a long-term plan and perspective. Expert leaders should be able to perform all five roles. there is not a good balance, the organization will be lopsided. Exerpts from: Burns, James MacGregor. Leadership. New York: Harper & Row, 1978. Print. A few years ago I ran my first half-marathon. Crossing the finish line amidst the cheers from my family was one of the most powerful moments in my life. Thinking back to that day, I’m reminded of how similar creating a High Performance Workplace (HPW) is to training for an athletic event. So how can YOU achieve the peak business performance needed to successfully compete in today’s market? As Abraham Lincoln once said: “The best way to predict your future is to create it.” If your goal is to create an HPW, then your first step is to visualize an environment where employees work in collaborative teams built on open communication, trust, and a sense of a shared mission – to improve outcomes. By thinking of your workplace in terms of athletic performance, it’s easy to see how important a healthy environment is to increased productivity. Just as important is obtaining an outside view of the current situation. The same is true in the workplace. Tip #3: Follow Knowledge with Action – The Road to Success. The canyon between knowledge and results is bridged by action. Develop a plan to achieve your goal and stick with it, remembering that change takes time to quantify. Progress was gradual. Remember . . . it’s a marathon, not a sprint. By obtaining an outside perspective to examine your current workplace performance levels, you might find that assumptions about low morale, high turnover, and declining revenues may differ from reality. At Lighthouse Leadership, we can help you achieve your HPW goals. PS: Using one of our Business Health Exams is a good place to start. You might be surprised to find out that often times the real hurdles to success aren’t the obvious perceived issues. Is your company’s leadership pool, a puddle or a lake? Is it wise to wait to invest training dollars in order to weed out the bottom feeders and invest in top performers once they’ve been slotted into managerial positions? Or should companies invest in training top performers prior to giving that big promotion? The answers to these questions rest on one fundamental fact: The talents and skills that make an excellent leader are completely different than those that enabled top performance in the previous position. Many companies fail to realize the shortcomings and consequences of not having a management development program in place for future leaders. Promoting top performers with no prior management experience can in fact be a recipe for disaster. Let’s take a look at Lisa, a consistent top sales achiever for a pharmaceutical company. Lisa had the opportunity to sit next to the national sales director at a meeting and, by impressing him with her unique and creative ideas for driving sales, was offered a regional sales manager position, despite not having any prior leadership training. Upon arrival to her new team, Lisa immediately relied on her sales skills and instincts, not possessing adequate leadership skills. She spent most of her time with the fun sales people chasing the big deals, instead of creating a team vision and goals, developing a strategy, or coaching her team members for better performance. Lisa also had difficulty prioritizing tasks and, because she hadn’t learned how to delegate, her poor time management caused her to fall behind, along with her regional sales. She was overwhelmed with “busy work,” and responded to problems with a “hair on fire” reaction. Within the first year of Lisa’s promotion to regional sales manager, once a top sales achiever, she was now discouraged and frustrated. She decided to leave the company, along with 70% of the original regional sales employees. That is a costly problem for a company to have. All too often managers are typically top performing employees who have been promoted into management positions. They have incredible skills in their present position but insufficient management skills to justify a leadership position. In Lisa’s case, she did not fail the company, the company failed her in their talent development strategy. Allow me to contrast Lisa’s experience with my own. I worked at a similar company with aspirations to become a leader within the organization. Early in my career I enrolled in the company’s management development program. The criteria to be accepted into the leadership development program included consistent top 50% performance markers over at least two years. This motivated my performance to be continuously “Exceeds Expectations.” Under the advice of a mentor I took charge of my own development and enrolled in company-provided training courses, read leadership books, learned public speaking techniques, conflict management, communication skills, employee engagement, and related courses that inherently made me a better employee. The company had a checklist of development requirements and assessments to be passed before qualifying to be a leader. Because the company used these advanced talent development practices and invested in me early on, they not only retained, engaged, and improved a top performer but also produced a High Performance Leader. And because of these practices they had a deep pool of ready talent, in addition to myself, from which to select for promotion. I coached poor performers to positions of success. I had learned to “inspect what I expected” from my team and follow through accordingly. We created a culture of accountability, which raised the bar for all of us. Not only did we achieve top 20% performance, I had earned the loyalty and affection of my team. Most importantly, I also invested in top performers by developing their talents to be ready for opportunities to be promoted. The Message companies send by investing in early training and development programs reinforce a positive response in their employees. 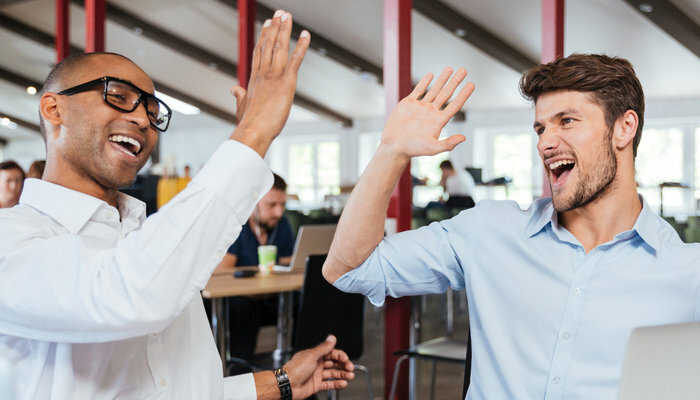 Employees who feel valued by their employer are much more likely to be passionate about their jobs and exhibit a strong drive to produce results. This in turn results in a high retention rate for the company. Additionally, an organization with a knowledgeable and passionate workforce will be significantly more successful than one with lackluster worker bees waiting for “quittin’ time”. Implementing quality training is just as important as implementing early training. Fortunately Lighthouse Leadership offers excellent training programs for management and leadership development. The classes and workshops we offer at Lighthouse are designed to improve your business, and fully leverage your most valuable asset – your people. Applying my decades of experience and education I proudly work hand-in-hand with my strategic partners to serve businesses like yours in the development of your people, the improvement of processes and the management of performance. Back to our original question: Is your leadership pool a puddle or a lake? It’s not going to become a lake unless you do something about it. I am prepared, ready and poised to help your employees build their skills now to be the High Performance Leaders of the future for your company. 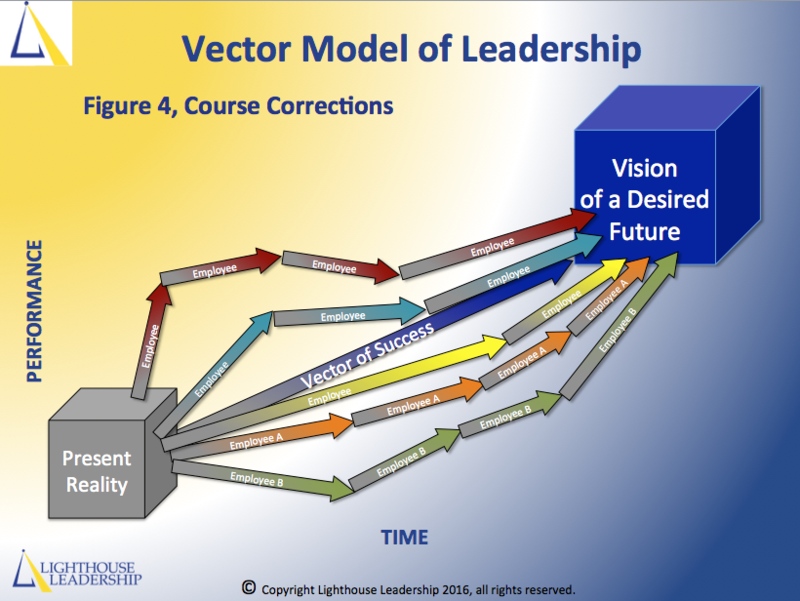 Contact Lighthouse Leadership today – the future is now! The panel at a NWEEO event included Julie Marshall, Ph.D. in clinical psychology, Nancy Cooper, J.D., and myself, with Jill Goldsmith, J.D. as moderator. We each brought a unique perspective and had a wonderful discussion. Here are some resulting thoughts. According to Derald Wing Sue, Professor of Psychology at Columbia University, micro-aggressions are “brief and commonplace daily verbal, behavioral, or environmental indignities, whether intentional or unintentional, that communicate hostile, derogatory, or negative slights and insults toward (people with a differentiating factor. )” Litigation cases of this type are growing, according to two Portland judges. Nowadays overt discrimination is less frequent than it used to be. In my opinion many people are better educated and truly feel that people should be judged on their own merits and inherent value as human beings, not based on DFs. Still, some less enlightened individuals have discriminatory thoughts but know how to keep them in the closet to avoid legal or employer discipline, or unpopularity. Micro-aggressions come in two varieties: those of genuine innocent error, and those borne of closet prejudice that pop out like passed gas. Oops! No I didn’t! I love to study and teach the science behind business practices, looking for evidence of why we do what we do, and what predictable consequences may occur. How we treat other people can be likened to a tree that starts from a seed, grows roots and branches, and eventually bears fruit. The seed starts out with its inherent DNA – the biological drivers that will shape what it becomes. Add nutrients in the soil, water, and sunlight; then the seed sprouts. When I bought my home I was excited that on the property was a big beautiful apple tree, heavy-laden with fruit. At harvest time I was excited to turn the apples into apple-crisp that I could freeze and enjoy at will with some ice cream. When I bit my first apple I spat it out. It was horrible! I had never before tasted an apple that bitter. Was it the seed (nature)? Was it the soil (nurture)? I had no idea. It didn’t really matter. I mourned over the uselessness of the fruit of my tree. Nature (DNA, instinct) plus nurture (upbringing, education) create beliefs. Thoughts create words and actions. Words and actions create micro-aggressions. Micro-aggressions are based on nature and nurture. To me, this logic is self-evident and intuitive. A micro-aggression is a message to someone that s/he is less valued or respected. That message creates feelings in the receiver of hurt, anger, contempt, and isolation. Those feelings lead to feelings back toward the micro-aggressor of distrust, disrespect, alienation and isolation. The back-and-forth feelings result in working relationships of passive aggression, dis-harmony, poor communication, and misunderstanding. Poor working relationships create a negative company culture low in trust, respect and engagement. A negative company culture reduces productivity. Low productivity means low profits. The bitter fruit of micro-aggression is lost company profits that, if un-checked, can lead to the death of the company. How can we change the fruit from bitter to sweet? We can’t change the seed, but we can add nutrients to the soil. We don’t want to uproot the tree, but we can prune it and bend it. We don’t want to cut the tree down but we can cut off the bitter branches and graft in sweet branches. Your organization can turn the bitter fruit of micro-aggression into the sweet fruits of harmony, engagement, and profit. Please contact me. I will help. Do you know someone who has much authority but little influence? I recall early in my career a would-be leader who had authority to direct the work activities of about 120 people. His style was authoritarian and controlling. He gave little trust or respect to others and received little trust or respect in return. Within six months of having his directing role, nearly half the people had jumped ship, resulting in a devastating cost to the organization. His influence had shrunk to be much smaller than his authority. Sound familiar? In contrast, I also recall a leader who seemed to genuinely care about us, put her own interests aside for the good of the team, sought the opinions of others, was supportive and encouraging, and had a grand vision of the excellent results we could achieve together. People from other departments wanted to transfer in to be on her team. Her influence expanded to include people she had no authority over. I hope this also sounds familiar to you. These cases show a stark difference between authority and influence. In the 1990s some Italian researchers were mapping the brains of Macaque monkeys. They noticed that the same area of the monkeys’ brains lit up when they watched the researchers eat lunch as when the monkeys themselves ate. This was the discovery of mirror neurons, and the beginning of a deeper understanding of how we are all hard-wired to influence each other. Much earlier organizational research had already concluded that individuals with leadership skills have social influence, and not necessarily because of the position they occupy (Bernard, 1938.) Influence is a complex social interaction that varies by both the influencer’s methods, and the intrinsic and extrinsic motivators of those being influenced. In his book, Working With Emotional Intelligence, Daniel Goleman revealed that in predicting the success of “those in technical professions, analytic thinking ranks third, after the ability to influence and the drive to achieve. (Goleman, 2011). Influence is a trait central to the Social Management competencies. By expanding our Social Management competencies we will be able to expand our influence. Radio interview of Lighthouse Director Doug Lundrigan by Jackie B. Peterson, author of Better Smarter Richer, on Solo Pro Radio. A few years ago I ran my first half-marathon. Crossing the finish line amidst the cheers from my family, who ran the last quarter mile with me, was one of the most powerful moments in my life. Thinking back to that day, I’m reminded of how similar creating a High Performance Workplace (HPW) is to training for an athletic event. It’s no secret that to successfully compete in a marathon you need to be in peak performance condition, and the same is true in the workplace. So how can we achieve the peak business performance needed to successfully compete in today’s market? If your goal is to create an HPW, then your first step is to visualize an environment where employees work in collaborative teams built on open communication, trust, and a sense of a shared mission to improve outcomes. Play a mental movie imagining a workplace that fosters a high level of team performance. The stronger the visualization, the more powerful the impact can be with greater results in improved services and products, better utilization of resources, and a more engaged workforce. Recent studies indicate dramatic changes in how leadership is perceived. High Performance Workplaces recognize that effective leaders are able to visualize long-term goals and then communicate those goals in a clear direction that excites the people around them. It’s your job to empower your team by inducing passion and commitment to ensure your organization keeps pace with changing times. Ready to achieve your vision for an HPW? Then it’s time to lace up those running shoes and test your business fitness level. Tip #2: Work with a coach. By thinking of the workplace in terms of athletic performance, it’s easy to see how important a healthy environment is to increased productivity. Just as important is obtaining an outside view of the current situation. For me to compete in a half-marathon I needed to gain the perspective of a training coach to assess my fitness level prior to developing a training plan. The same is true in the workplace. If your goal is to improve workplace performance, and you’re noticing declining revenues, low productivity, and high employee turnover, then you’ve got some work ahead of you. To enhance your awareness of the scope and magnitude of the challenges you face, seeking coaching help is in order. Interestingly, a 2013 Stanford Graduate School of Business Survey concluded that 100% of the CEOs surveyed stated they’re receptive to coaching; yet only 34% of CEOs currently receive leadership advice from coaches. Do you need a business coach? Using one of our Business Health Exams is a good place to start answering that question. Leadership assessments, employee surveys, personality profiles, and aptitude tests can help diagnose areas for improvement. You might be surprised to find out that often times the real hurdles to success aren’t the obvious perceived issues. By obtaining an outside perspective to examine your current workplace performance levels you might find that assumptions about low morale, high turnover, and declining revenues may differ from reality. For example, when training for a race you might think you only need to focus on your speed and endurance. The reality is that you need to develop a comprehensive training plan that maps out daily progress goals to help you lengthen your stride, improve your gait efficiency, optimize your nutritional intake, etc. Executive business coaches, like successful athletic coaches, are able to take into consideration the less obvious performance factors that may contribute to poor results. Working with a coach can help you stay focused and keep moving forward. You’ll also gain the skills needed to keep track of what is happening in the team, why it is happening and what can be done next to keep the team on the desired road to success. Tip #3: Follow knowledge with action; the road to success. The canyon between knowledge and results is bridged by action. Develop a plan to achieve your goal and stick with it, remembering that change takes time to quantify. For example, I trained for a year before achieving a fitness level to successfully compete in a 13 mile run. Progress was gradual. I learned which Key Performance Indicators (KPIs) were necessary and, with my coach, we built a training program where I tracked my progress in key areas such as resting/peak heart rates, distances per week, and nutritional intake. KPIs used to measure High Performance in the workplace include the little steps (such as number of new prospects called on, number of marketing impressions made, units of waste, or turnaround time), and the big results (such as increased revenues and declining expenses, or a noted higher level of employee engagement and satisfaction.) The little successes lead to the big ones. As with the action involved in training for and running a long-distance race, business challenges require discipline, hard work, and perseverance. Your executive team, your coach, and the significant people in your personal life will all be integral in encouraging you to keep on keepin’ on. As cliché as it may seem, having someone on the sidelines cheering, “You can do it! Keep up the great work! I believe in you!” can make all the difference in success or failure. By continuing to measure and gauge your progress in these areas you’ll reach the finish line at the head of the pack. Visualize success and carefully track the indicators that move you closer toward your goal. Radio interview of Lighthouse Director Doug Lundrigan by Jackie B. Peterson of Solo Pro Radio. Privileged to observe the inner command workings of the USS Helena, a fast attack nuclear submarine that holds greater fire power than the entire U.S. Navy did in World War II, was a humble reporter. “What do you do if they don’t repeat it back correctly?” asked the reporter. “I repeat it to them again until I hear it back correctly. We have a zero-tolerance policy for communication errors here,” explained the commanding officer. Is there anything we do all day, every day that is more important to do well than communicate with others? Yet, with all the practice we have had throughout our lives, misunderstandings seem remarkably frequent and almost the norm in many organizations. Obviously, a breakdown in communication on a nuclear submarine would be catastrophic. Yet, in business, miscommunication can be fatally damaging, too. Technology makes communication fast and loud. A company’s culture and its customers’ goodwill can shift quickly. Is it any wonder that some of the world’s leading businesses invest considerable resources developing better communication skills in their people? While the challenges to achieve an accurate transfer of meaning between people are as numerous as the people on the earth, improving on a few common errors can go a long way toward stamping out miscommunication. When communicating with others, don’t we often focus on getting our point across, making the case for our position and being heard? I know I do. When listening to someone, my mind often goes to the place of preparing my rebuttal. Contrary to some, I believe we can’t really listen when our minds are in that place. Oh, we might hear the words he or she is saying while our minds churn, anxiously waiting for our turn to talk, but the meaning of the other person’s words are often lost in the chasm between our ears and our mind. The human mind is an incredibly creative force. When we have less than the complete facts (almost always) our minds will automatically try to fill in the blanks based on past experience. A complete story emerges in our minds – a hybrid of fact and fiction. This is the birthplace of an assumption. The trouble is, our assumptions are often wrong. The supreme assumption that leads to myriads of error is the assumption that our perception and interpretation of events is accurate. We think we’re right. And if I’m right and someone else’s perception differs, it means the other person is wrong. Now we have conflict. The remedy is to be constantly aware that at any given moment we probably harbor some false assumptions about people and events around us and would be wise to acknowledge that there’s probably something in our head that is not factual. The remedy is surprisingly simple: play submarine. When someone says something, repeat it back. Perhaps repeating it verbatim might seem a bit tedious or rude, but a simple statement rephrasing what you think you heard can do wonders in matching words to intent and increasing mutual understanding. We had a blast! We won awards! We were recognized by our peers and the C-suite for our excellence! Work was exhilarating and fun! Our competitive advantage was overwhelming! That was the best team I ever worked with. Have you ever had an experience like that when working with a team? You can! A team is only as strong as its individual members, and is only successful when those members work well together, enjoy each other, and complement each other’s skills. The kind of high performance, engagement, synergy, and enjoyment achieved by the best teams does not come by accident, nor without cost. The only sure thing is, a great team is worth the work, worth the cost, and worth the effort to keep it together for the long haul. So, how do we do that? Keep reading, because if you can implement the concepts explained here, you will see real results. Like the supports to a three-legged stool, if any one of these three aspects is weak, the team fails. In order to carry its weight, to do its job, to perform well under pressure, your team needs these Three Legs. To discover how to develop your team’s strength in the Three Legs, read on. First, we need to make sure everyone is onboard. Let’s begin with Team Orientation.. It’s time to get to know each other, and yourselves. 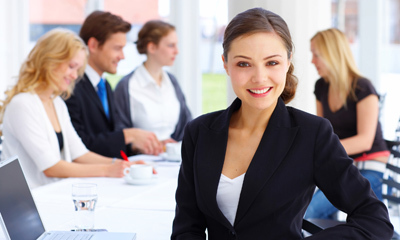 This part of the training will enlighten team members on the four stages of team development. The team will then discuss and form a consensus on their current stage in team development. The team orientation and training program proposed here will strengthen each of the Three Legs. The training elements include: pre-training assessment, training content, post-training evaluation, and intermittent reinforcement. Team members will complete a pre-training assessment, receive instruction on the four-stage team-development model described by Robbins and Judge (2007) and how to work with the diverse styles of others, and then participate in team learning simulations. Yukl (2006) suggests that an outside facilitator is most effective when conducting training simulations, based on an objective third-party perspective. Now we need a way to keep track of all these great discoveries about the team, its members, and the ways in which they best work together. Effective teams construct a team charter to define communication methods, collaborative roles and responsibilities, and how to manage conflict. The team charter is constructed as each part of training on the Three Legs is completed. Team leaders will receive post-training evaluation scores and conduct intermittent reinforcement training with members to hone skills and ensure real behavior change. A leader will attend team meetings to observe and coach toward improved execution of training knowledge and the terms agreed to in the team charter. No, a good team is not made up of carbon copies – a team needs different styles, different skillsets, and different ways of looking at things. Otherwise, you might as well just have a “team” of one, right? Instruction on differences and characteristics of communication styles will enable members to view each other’s differences in a non-judgmental manner. Next, members will review and compare self-assessments in a group discussion. Training will continue with simulations to practice adapting their communication to people of other styles. They will practice overcoming communication barriers. The team will also decide on, and describe to other team members, their preferred and most efficient methods of communication, whether by e-mail, voice mail, telephone, teleconference, or face-to-face meeting. Okay, so the team members understand how they differ from one another. Now it’s time to learn how to embrace those differences, fill each other’s weaknesses, and create a whole that is greater than the sum of its parts. This instruction will focus on collaboration that leads to synergy. Team members will use pre-training assessments to create a team skill inventory listing the total skills possessed by the team. Efficient division of tasks will be discussed using the team charter. Team members will record in the charter the roles, responsibilities and efficient division of labor. The Third Leg: Conflict Management. You didn’t think we could bring all these different people together in perfect harmony, did you? When people bring together different ideas and different opinions, conflict is inevitable. Conflict can range from a mild disagreement on some minor issue, to strong emotional objections to another’s opinion, style, or beliefs. The goal of this part of training is to teach strategies enabling members to respond to all levels of conflict constructively. In the training workshop members will use a controversial political issue to practice some of the characteristics of high-performing teams: handling conflict directly, listening, consensus building, compromising, understanding, empathizing, respecting, and recognizing that team members can agree to disagree. Decisions on how the team will resolve conflict will become part of the team charter. To explore the application of the above training program to your own team, you need a good handle on personality of the team. You will need to examine the current state of the team, how to fit the program to the unique challenges of this team, the specific results that are required, and the incentives for team performance. It really works! This training plan as outlined will transform your group to a high-performance team. 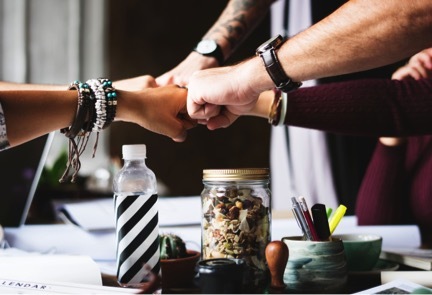 Commitment to the team is proven to increase as dialogue and activities foster mutual understanding, cohesiveness, cooperation, and identification with the group (Yukl, 2006). This training itself will give team members an opportunity to become more cohesive, leading to further development of the Three Legs skills, and their application to the unique challenges of your team. Robbins, Stephen P. and Judge, Timothy A. (2007). Organizational Behavior, Twelfth Edition, Prentice Hall. Copyright © 2007 by Pearson Education, Inc.
Yukl, Gary, (2006). Leadership in Organizations, Sixth Edition. USA, Pearson Prentice Hall. You may be throwing wealth away every day. Don’t take offense…your business isn’t alone. Most businesses are tossing gold on the trash heap on a daily basis. Many owners and managers have been trained – both by education and tradition – to squander this good-as-gold resource. For most businesses, this is simply the way things are done – much to their detriment. Imagine how your business would run if your employees were as engaged in your business as you are. That ‘gold mine’ that you may be ignoring; the wealth you might be wasting is your people. Every business relies upon its people. Every job, from the most menial to the most complex, is necessary, and contributes to the success of an organization. And in most companies, every job function is clearly defined, and every employee held to a routine performance of those duties. Routine expectations is how the ‘gold’ is ignored, and the wealth lost. Because that routine expectation underlies employee management – so prevalent throughout the business world – tosses away the true potential of every employee. That management style belongs to a bygone era. Are You Applying 19th Century Management Principles to 21st Century People? Taylor believed in breaking down each job into simple, repetitive tasks defined as a narrow range of activities, isolated unto that job title. The duty of each worker assigned to a given job title was to perform those tasks unerringly and unendingly – and nothing else. Sound familiar? It should, because Taylor’s principles are still the method of management applied to the employees of most companies. Scientific Management was published at around the time the Wright Brothers flew the first airplane. The Wright Brothers’ early designs have long been relegated to museums and history books. But unfortunately for modern business, the same cannot be said for the principles of Scientific Management. Taylor’s principles may have been suited to the bygone industrial era but they’re no more viable in today’s information era than the Wright Flyer would be at Portland International Airport. You can mine the gold. There is a better way. If your company is seized in the grasp of the dusty old theories of Scientific Management, the alternative is quite simple: allow your people to be PEOPLE, not automatons! Machines now perform many of the jobs that were performed by people in Taylor’s time. You don’t have machines on your payroll; you have people. And by asking no more of people than you would of machines, you’re leaving gold unmined. You’re wasting a vast wealth of untapped potential. The new paradigm is the High Performance paradigm. People aren’t machines. Each employee offers a wealth of creativity, energy and talent that is ignored and squandered under the old paradigm. If you think that the new High Performance paradigm is just ‘touchy-feely’ new age nonsense – think again. Huge companies – companies that have been around for generations, like Sherwin-Williams, Tektronix and Corning – are converting to research-based High Performance principles. For daring to be different, for courageously casting off tradition, these companies are reaping massive benefits in improved employee productivity and reduced costs. Is your company lagging behind? Learn how to find, mine and keep the gold that works for you. Call us at Lighthouse today to get acquainted.